To mark Beijing's Tiananmen Square crackdown in 1989, thousands of people attend an annual candlelight vigil at the Victoria Park in Hong Kong, June 4, 2015. In Hong Kong’s Victoria Park, people each year gather for an annual candlelight vigil to remember the victims of China’s 1989 crackdown on pro-democracy protesters in Tiananmen Square. It is typically the largest such gathering for Tiananmen because China bans such demonstrations in the mainland. Last year’s vigil drew 180,000 people. Tens of thousands of people packed Hong Kong's Victoria Park for the rally. Some protesters say this year’s vigil has greater resonance because it comes just months after mass pro-democracy demonstrations in Hong Kong and the city remains divided over demands for universal suffrage. U.S. Congressman Eliot Engel, the top Democrat on the House of Representatives Committee on Foreign Affairs issued a statement marking the somber anniversary and commending Hong Kong residents for their "courageous protest". "This year Hong Kong’s stand for Tiananmen bears even greater significance, as the Legislative Council debates electoral reforms dictated by Beijing. The struggle in Hong Kong today for greater autonomy echoes the call for fundamental rights and freedoms sounded in Tiananmen Square 26 years ago. Just as the Chinese government gains nothing by denying the events of June 4, they gain nothing by crushing the aspirations of their own citizens in Hong Kong," Engel said in a statement. Demonstrators blocked Hong Kong’s streets for several months last year demanding direct elections of the city’s leader. Beijing and Hong Kong’s government instead want nominees for Hong Kong’s chief executive to be chosen by a committee. Later this month Hong Kong’s legislature will vote on the proposal. The protests were eventually disbursed without a single major concession by authorities. Joseph Cheng, a professor of political science at the City University of Hong Kong said, "Most young people today understand the strong ties between China and Hong Kong. There was tremendous emotion on June 4, 1989, because the feelings were at that time that what happened to China that day, could happen to Hong Kong." Cheng said living standards of Hong Kong’s citizens have declined in recent years, contributing to widespread discontent. "There is an acute awareness of our dependence on China. And increasingly because this economic integration between mainland China and Hong Kong has not been able to bring economic benefits to the people, authoritarianism of China is seen to be effecting not only the stagnation of democracy in Hong Kong but also adversely effecting our core values, our lifestyles, and therefore there is a certain resentment against the Chinese authorities among young people in Hong Kong," he said. In the past, the Tiananmen vigil has been a time of solidarity among pro-democracy groups. But this year there are signs of divisions over the direction of the democracy movement itself. Protesters carrying yellow umbrellas, the symbol of the Occupy movement, march on a street in Hong Kong, Feb. 1, 2015. 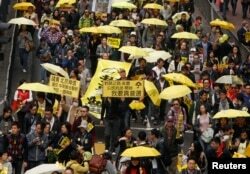 ​The anti-communist group Civic Passion holds its own rally in Kowloon. Hong Kong University’s student union has a separate event on campus, and the Hong Kong Federation of Students has also decided to not take part in the Victoria Park candlelight vigil. Demonstrator Pa Sha said Hong Kong’s young protesters do not believe the organization behind the vigil, the Hong Kong Alliance in Support of Patriotic Democratic Movements, has done enough to advance democracy in Hong Kong. “They are dissatisfied because these people are dominated by pan-Democrat politicians and they see them as very conservative, unable to advance the Democratic cause in Hong Kong or China. So people are looking for alternatives," Pa said. Any mention of the 1989, crackdown is banned in mainland China, while young protesters in Hong Kong vow to continue what they see as a long term fight for democracy in the city. On June 4, 1989, the Chinese Communist Party-run government sent tanks and troops to disband weeks of protests in Tiananmen Square. Estimates of the death toll range from a few hundred to a few thousand.